Hello festive friends! My week of handmade has continued with a great recipe I found for a festive sugar scrub that is now making its way in various states of bubble wrap and tissue paper to friends in far – and not-so-far – flung places in time for Christmas. We’ve all got clothes with ‘what-was-I-thinking?’ prints on them, right? No? Just me then. Well, whether you have a garish shirt or a few scraps of material kicking about you can breathe new life into them at this time of year. Wreaths make an appearance every year but they can be a bit expensive, especially if you opt for one with plenty of foliage year on year. Last year I made a couple of fabric wreaths using offcuts of material and they turned out pretty well. I’ve been a little quiet since my post-a-day challenge – my apologies. Things have gradually become more manic with the impending festivities just around the corner and a pretty big leak in our roof needing urgent attention. I decided to do something a bit different this year and make the majority of my Christmas presents for friends and family. 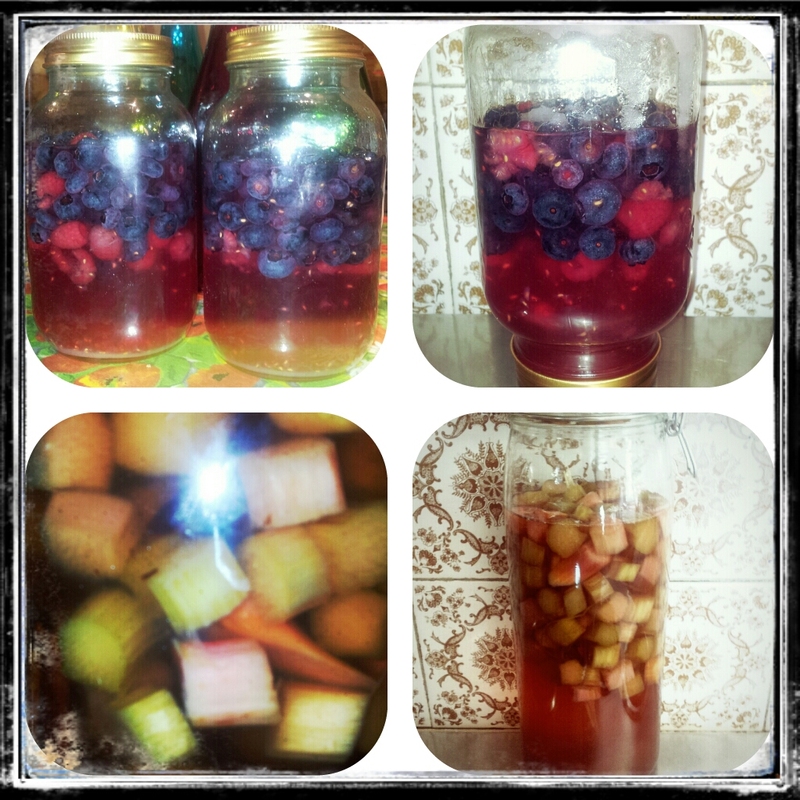 A while ago I shared a post about making your own liqueurs as gifts, which you can read here. If you gave it a go they are just about ready to gift or sample, depending on how generous you are feeling! 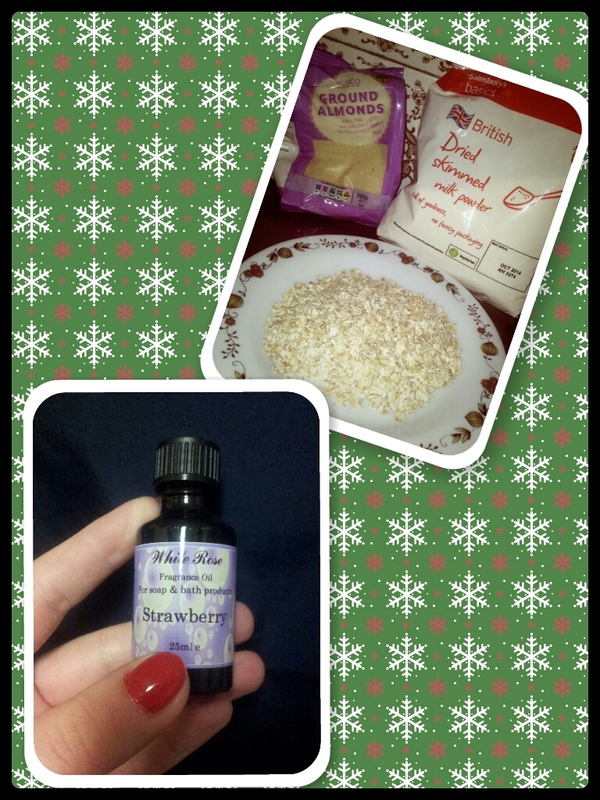 * In a small bowl combine the oats, almonds, milk powder and your essential oil. Stir well to make sure it’s well mixed. Close your eyes and take a deep breath – are you at Wimbledon enjoying a cream tea and a glass of Pimms? No? Then add more of your essential oil. Stir. * Divide the mixture among pretty cloth bags. I chose to use organza favour bags I got in Tesco. They sell them in bags of 3 for £1.50. Fill about half full and close using the drawstring on the bag. If there isn’t one you can gather the material and twist it round, securing with a festive piece of ribbon. I managed to fill around 2 bags with this amount so adjust accordingly. 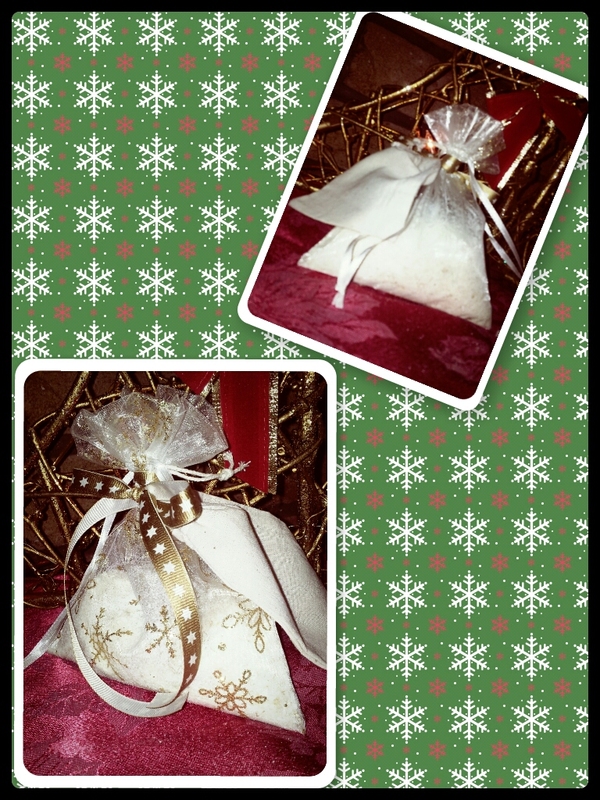 * I added a muslin bag to each of my gift bags. I got these off Ebay for around £5 for 10 bags. When you fancy a soak in the tub simply fill the muslin bag with around 2 dessert spoonfuls of your mixture and tie. Hang it on the end of the running tap of your bath and let it all infuse and you’re all set for a relaxing bath! The bags can be reused as many times as you like, just empty and hand wash with soap and warm water after your bath and leave to air dry. * Keep your bath soaks in a cool dark place until you are ready to use them. * Obviously this is not for human consumption, regardless of how delicious it smells. * The oatmeal mixture is designed to sooth stressed and dry skin and can relieve itching. However, some skin types may become mildly irritated by the essential oil. You can reduce the amount of essential oil you add or eliminate it completely. It obviously won’t have the fruity scent in this instance but won’t stop you making like Cleopatra and enjoying a milk bath. * These bath soaks are best enjoyed with emails unchecked and phones switched off. The world can wait. Just relaaaaaaaax. 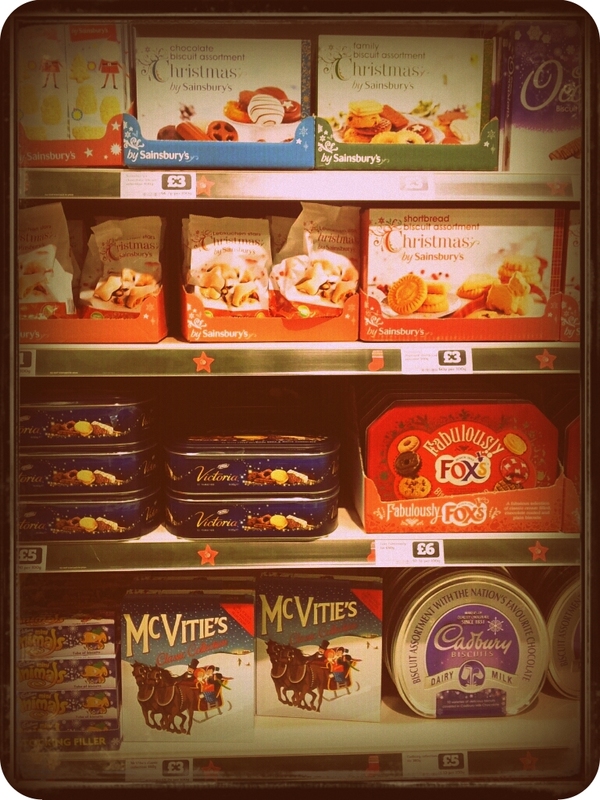 It’s barely the middle of September and already the supermarkets are clearing space for their seasonal stock. I was shocked when I visited my local Sainsbury’s and saw festive biscuit tins and Lindt chocolates line the promotional aisle but it prompted me to stock up on some festive essentials of my own that will be transformed into the perfect boozy gifts in just 3 months time. 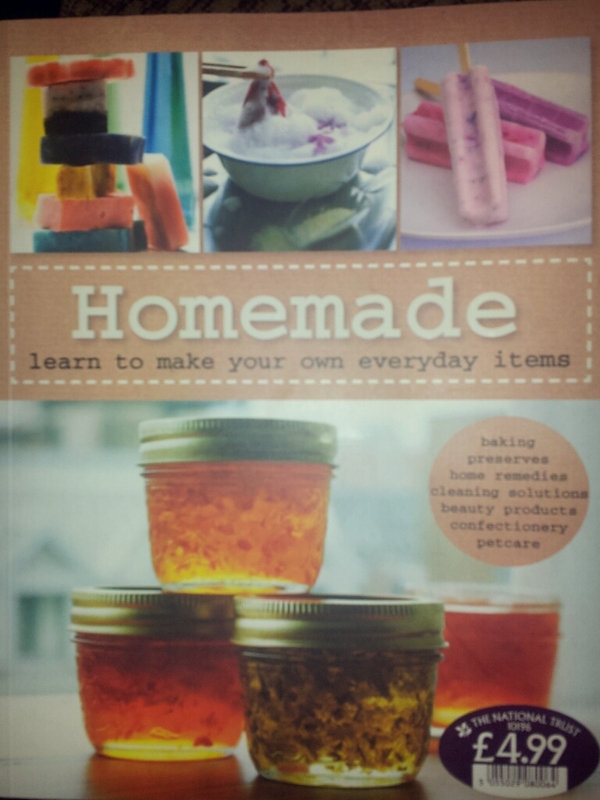 I’m a big fan of homemade gifts whether money is tight or not. There is nothing better than seeing the joy on someone’s face when they unwrap a present that has been made just for them. Now while I love having a go at all things homemade my skills in this area don’t always match my enthusiasm for the challenge. However, there are some things that even I can’t get wrong and fruity vodka is up there with the best of them. 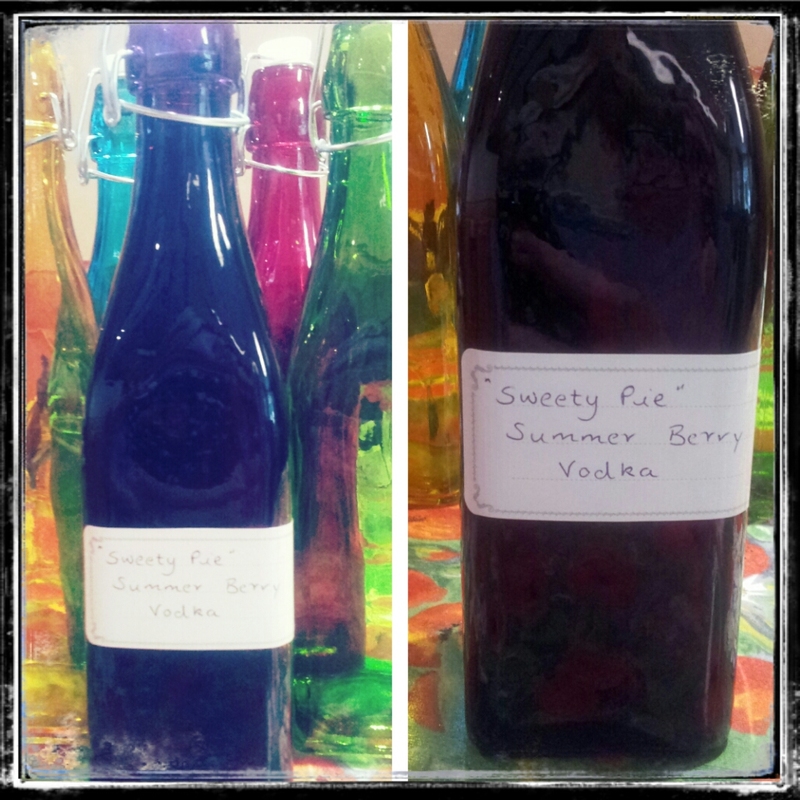 I learnt how to make fruity vodka at a friend’s summer bbq where one of the guests had brought their own raspberry version for us to try. I’m not one for drinking spirits neat but this was unlike any vodka I had tried before. It was a sweet and syrupy liqueur and it packed a delicious, fruity punch! I couldn’t wait to try to make my own! * 2 x large vacuum seal jars. I got a couple of Kilner jars in Tesco for about £3 each and they are pretty good. However, I was in IKEA at the weekend and picked up 1 big jar from the Korken range for £3 so do take a look there as you only need one of these so it would take up less space in your kitchen. You can take a look at the one I bought here! * 1 70cl bottle of vodka. Any vodka will do but as with anything the better quality you start off with the better end product you’ll get. You don’t need to buy the most expensive vodka on the shelf but do look out for good offers down the alcohol aisle. I picked up a bottle of Stolichnaya vodka for £13 in Tesco the other day, it normally retails at £19 which I would never pay so I think I got a good deal! * 500g fruit. Be as creative as you like. I have had success with the following mixes – raspberries, blackberries & blueberries, raspberries on their own, blueberries on their own. Berries seem to work well! I am also currently experimenting with a rhubarb version which has 500g rhubarb, 1 x cinnamon stick and 1 x tsp vanilla paste. No idea how it will turn out but if it tastes half as good as it smells it will be delicious! The method is simple! Put the ingredients into your jar or divide evenly between the two jars should you prefer to use smaller jars. Turn the jars upside down a few times to get the ingredients to mix. The sugar usually sticks to the bottom of the jar but over time they will all mix together. Next you just need to leave the jars in a cool dark place (mine is a cupboard under the oven) and turn them upside down and back to upright a few times a day to encourage the ingredients to mix together. Do this for at least 2 months. The longer you can leave it the stronger and richer your liqueur will be. When it’s nearly time to give your gift – or you decide to enjoy a tipple yourself, you have earned it after all! – you need a funnel and a bottle to decant your liqueur into. I picked up some really pretty coloured bottles for under £1 each at one of the discount shops near where I live. The first time I decanted the berry liqueur I found that some of the raspberries had started to disintegrate and slipped through the funnel into the bottle so I’d recommend balancing the funnel in the top of your bottle and putting a sieve over the funnel to catch the fruit. A bit fiddly but worth the effort! …and they really are! I properly discovered the joys of freecycle today when I registered and listed my first item for offer. Moving to London I’m clearing out a lot of stuff, selling some stuff on Ebay and giving some things to friends. But there are a few things that could go to a good home of somebody I just haven’t met yet so I headed to freecycle this morning and signed up. Just a few minutes after listing my first item I got an email from someone interested in it and by dinner time an ill-purchased chin-up bar was on its way to a new home with a man called Stephen. It felt pretty good to know that someone else would be getting use out of it and that it wouldn’t be adding to an already massive pile of equally useable stuff on a landfill. Freecycle seems to be a pretty cool community of laid back folk wanting to help each other out and there are some pretty interesting things listed on there. 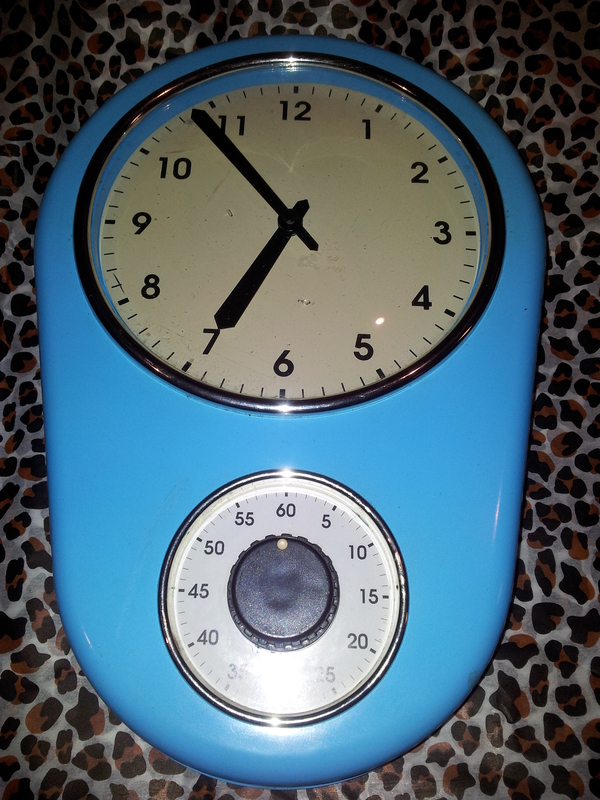 For example, in the Belfast group there is everything from camcorders to dining tables and chairs to baby baskets and bubble wrap, (not to mention a lovely retro blue kitchen clock from yours truly!) If you fancy de-cluttering and are pressed for time I’d recommend it. You can also post if you are looking for a particular item and if someone has it they will get in touch. Why not give it a go? You literally have nothing to lose but you might just gain something!